We present ourselves as one of the premiere guest houses in Greater Noida. We have been recipients of immense patronage from some of the biggest business houses in Greater Noida for their visiting guests. Angel Residency is the preferred choice for amongst Guest Houses in Greater Noida. 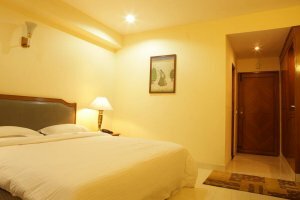 We offer you most tastefully furnished rooms that promise a home away from home to each guest. The locational advantages enjoyed by Angel Residency start from the very city we are in. Greater Noida is touted to become the most frequented business and activity centre in North India. With Infrastructure developing at a surprising pace, the city is already home to some of the biggest names in the corporate world. Our Hotel in Greater Noida – Angel Residency, offers you proximity of mere 1-2 minutes drive to the India Expo Center in Greater Noida.